Are you ready for this one? Here we go with the next installment of the strange story we have been working our way through. Funny thing, I haven’t come up with a title for the whole, if you have some ideas feel free to pitch them in the comments. This portion will be the end of the second section of story. As always if you want to refresh your memory or catch up to where we are now follow the links below. The hallway beyond the building’s front doors was empty. Abel’s place was on the third floor. Stan had used the elevator coming and going yesterday but he chose the stairs today. He couldn’t explain why but he needed a bigger picture, the larger view of the situation; he needed to see the space around him. Something wasn’t right but he couldn’t explain it at all. The creaks and groans of the building around him echoed in the silent halls. Energy saving lights flicked on to his presence in the halls. At first he thought he encountered another person but it had been the building going on like he belonged there. Abel’s door had taken a sickly glow in the light of day. Shadows from the windows in the hallway and the halogen bulbs flickered and fought at the doorway. He waited with his finger at the doorbell but couldn’t bring himself to push it. A voice in his head insisted he open the door as only a concerned friend would but at the same time he felt a distance between him and the door, an imposing distance that he couldn’t bring himself to violate. In the end he pushed the doorbell. Stan glanced back and forth between the two of them. He couldn’t focus, couldn’t see them as they were in front of him as his mind raced through the images of Abel’s face bruised and battered. It wasn’t right, this wasn’t right at all. “What are you talking about? Stan, we have been friends five years now,” Abel said. “This is some kind of joke? Take some time off. Go home and spend time with your wife. Tell you what, I’ll call Charlotte for you now. The both of you can walk home together and discuss your vacation.” He picked up the phone on an end table and hit the buttons. The click of the lock echoed in Stan’s mind. The snap of a wild synapse woke him to his situation. He couldn’t stay here. He should have known something was wrong. Abel had healed so quickly, much too quickly. The world around him melted as the walls of the apartment closed around him. Ema and Abel stepped closer to him, pushing through his bubble of personal space. “Enough!” His outburst stopped them short. In the free second he had won he pushed against both of them and knocked them away. In that moment he charged the door and twisted the lock. He slammed the door open and shot out into the hallway, then down the stairs. At the bottom of the stairs his heart slammed against his ribs as his lungs screamed for air, but he didn’t stop. He pushed himself through the main doors of the building and back out onto the street. He didn’t look back, didn’t check for pursuit. His only chance was to build a lead and get as far from them as possible. When he finally stopped in an alley several blocks from Abel’s building he ducked down behind a dumpster and pressed himself into the shadows. The fwap fwap fwap of rubber soles on pavement rushed past the mouth of his alley. They had run past him, he was sure of that. Though he held tight to his position in case they circled back. 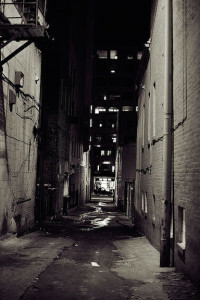 The alley was a dead end. His only way out was the way he came. He looked around in surprise after a rock smacked into his arm. A small rock, slightly bigger than a pebble but it hit with thrown force. It hadn’t fallen from the roof of the building he sat under. When the second rock hit him he caught the movement from a doorway a bit further down the alley. A slim hand had snaked through a doorway cracked open and whipped another rock at him. Stan looked back toward the mouth of the alley and then sprinted to the open door. As he crossed the threshold a hand reached out and grabbed him by the shoulder, slammed him against the wall and another covered his mouth. The room was dark and he didn’t have a chance to see the face of his assailant before the door closed tight and the little light it offered disappeared. As his eyes adjusted, he searched the darkness. A flicker of light emanated from the far side of the room, a thin strip under a door. The glow outlined his assailant, though not enough to discern the assailant’s features. The man was definitely shorter than him and had a smaller build. He didn’t need light to make note of the man’s intensity. Charlotte. “I didn’t do anything,” Stan said. His mind raced through the attack, and his trip home. He hadn’t seen anyone through the entire exchange. “Who the hell are you?” he said. She let his hand fall, and then stepped away from him. “I am concerned,” she said.